The lifelong work of the late Dr. Howard Hendricks was invaluable to creating this module. We also owe debt of gratitude to the Bible Training Centre for Leaders (BTCL) and Bible Training Centre for Pastors (BTCP). If you would like to do the Observation Game with your group, click here for the video. For follow up on the exercise, click these to links to watch videos by Dr. Hendricks. Video 1, Video 2. If you would like to do the Interpretation Game with your group, click here for the video. Click here to see Dr. Hendricks talk more about Interpretation. If you would like to do the Application Game with your group, click here for the video. 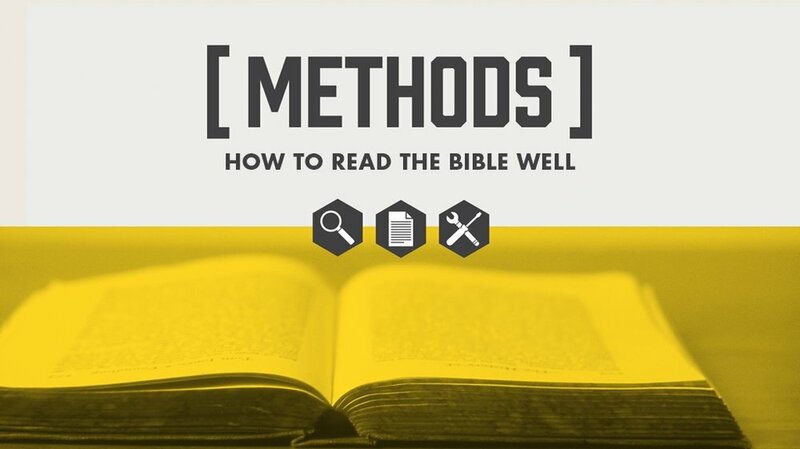 Click here to see Andy Stanley teach on this passage, noting how he uses Observation, Interpretation, and Application. As mentioned in the workbook, there are some online tools to help with the Interpretation process. The first passage below gives you an indication of how to use a few of the tools. Genesis 1:26–31. Early in Genesis, we read that people were created in God’s image. • What comes before and after this passage? • Some perspective from the original audience. • Tidbits about the original language used. Genesis 3:6–12. However, when given the choice, people damaged their relationship with God by willfully disobeying him. Genesis 3:17–21. This disobedience introduced sin into the world, and came with consequences. Genesis 12:1–5. God tells Abraham that he will be used in a great way to bring people back into a right relationship with God. Exodus 3:5–10. After 400 years of God’s people (Israel) being enslaved Egypt, God announces his plans to use Moses to rescue them. Exodus 20:1–6. Once rescued, God begins to instruct Israel on how they should be set apart from other nations. Joshua 1:1–9. After the death of Moses, Joshua takes over as leader of Israel. Judges 2:6–15. Over time, God’s people forgot about his promises to redeem them. 1 Samuel 8:4–9. Israel desires to be like other nations and asks for a king. 2 Samuel 7:18–26. God promises to make his name great through David. 1 Kings 11:9–13. David’s son, Solomon, takes over as king. Because of Solomon’s disobedience, the nation of Israel would be divided and in disarray for 200 years. Isaiah 49:8–13. God promises to one day bring forth a new leader to restore a relationship between God and his people. Jeremiah 31:31–34. God will make a new kind of covenant to his people. Ezekiel 37:1–14. The prophet Ezekiel paints a picture of how God will one day restore Israel. John 1:29–34. John the Baptist introduces Jesus as a messiah. John 5:19–27. Jesus talks about his relationship to his heavenly Father. John 14:1–7. Jesus gives more explanation of who he is. Matthew 13:44–46. Jesus speaks about the kingdom of heaven. Matthew 26:36–42. Jesus prays regarding his coming death. Hebrews 9:11–15. The writer contrasts the new covenant (Jesus) with the old covenant (sacrificial offerings). 1 Corinthians 15:12–18. Paul writes about the importance of Jesus’ resurrection. Ephesians 4:17–32. General instructions on Christian living. Philippians 2:12–18. General instructions on Christian living. Colossians 3:12–17. General instructions on Christian living. Methods is a Theopraxis module.